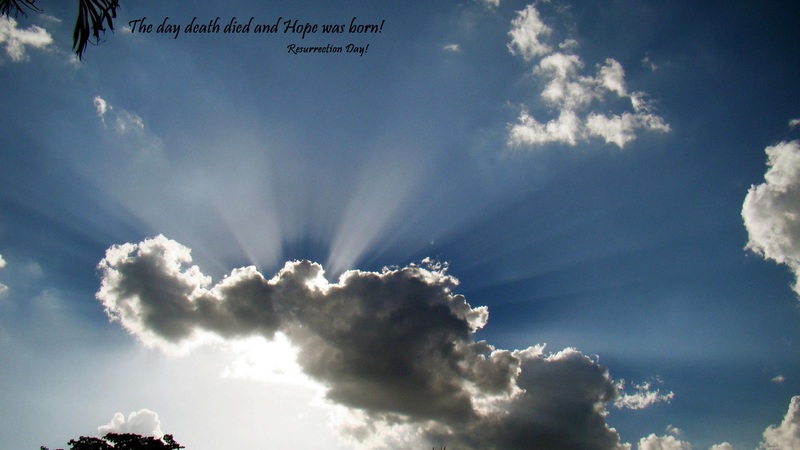 The Day Death Died and Hope Was Born! My daughter and I sat in the church building, we were visitors to hear my good friend from Indiana sing. The church’s announcements were flashing on the overhead and it caught my eye: “The Day Death Died”, it was the name of their cantata to be performed on Resurrection Sunday. I looked at my daughter and said, “I really like that, the day death died.” She nodded and smiled. What followed was a solo version of my happy hallelujah dance through the dining room and kitchen. Sunday morning: HOPE WAS BORN! Our Hope is alive and well! Our Hope sits at the right hand of Abba Father! Our Hope is coming back one day! Our Hope: a meek lamb coming back as a roaring Lion! May you be blessed to overflowing, by the God of Hope, this season of passion, this holiest of holy weeks. Powerful! HOPE IS ALIVE! Hallelujah…and our Mom is there with HIM on this Passover/Resurrection week. Wow, what a wonderful celebration heaven is having. AMEN you Holy Spirit-filled happy hallelujah dancer ! Hope one of my favorite lifeline words! xox right back at you! What a inspirational reading! Thank you for all you share. We hope you had a beautiful Easter! We are just now driving back from Cocoa where we met daughter Judy, Jimmy and our granddaughter Maren for the Easter weekend. Hope to see you when we are up for Memorial Day. We serve a risen Savior, amen? OUR LIVING HOPE.